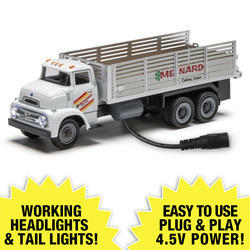 Buy any O gauge train item $19.99 or higher and get a $29.99 lighted Menards stake truck for FREE! That means you can "make" $10 on over 100 different O gauge train items priced at $19.99! IMPORTANT: This offer is valid on online purchase only. You MUST add (1) lighted Menards truck (SKU# 279-4601) to your shopping cart for every item $19.99 or higher that you wish to purchase. The free truck price will be subtracted as part of the checkout process. OK I guess one more piece of rolling stock and another stake truck can’t hurt anything! Thanks Mark. Good looking truck but I am thinking a repaint for the Spokane Portland & Seattle RR. What year is the prototype....about 1955 and Ford?